The Foundation for the Study of Infant Deaths (FSID) is running a cot death awareness and fund-raising drive during May. Sudden unexplained infant death – commonly referred to as cot death – is the UK’s biggest killer of babies over one month old, claiming the lives of around 300 infants every year. Save a Baby Month, the Foundation for the Study of Infant Deaths’ new annual awareness and fundraising drive, aims to make sure that each and every parent of the more than 600,000 new babies born each year in the UK knows the steps they can take to reduce the risk of cot death. 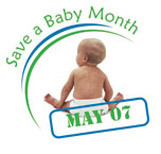 For more details see – Save a Baby Month web page. Also see the earlier post: Sudden Infant Death Syndrome – Charity wristband to fund research into cot deaths. This entry was posted on Tuesday, May 1st, 2007 and is filed under Babies, Children, First Aid, firstaidquiz.com. You can follow any responses to this entry through the RSS 2.0 feed. Both comments and pings are currently closed.